Back in January 2014 wizmacnz posed the question "3D Printing is anybody doing it ?" Well it's now 2018 and it seams to be one of the fast growth areas of of our Hobby as printers come down in price and more people get to grips with CAD design and produce their own Items. Locos, Wagons, Carriages, Buildings and all manor of accessories and useful bits and bobs not available in RTR or just not available ! Alan has created a new area for any 3D Content so anyone who is using it or wants to learn how to! has a dedicated area to chat in. I know Nigel dabbled in 3D in his On30 thread Danielb has just got one, Wizmacnz who posed the original question, Wahiba, The Bankie and probably a few others are all using them so feel free to join in here, start your own 3D workbench thread to show what your up to and post any useful links you come across. I'll start a separate thread dedicated to quick Help Q & A's so please use that ONLY to ask or answer a quick technical or Operating question and use other threads for general discussion. I'll also start a useful links thread and again please just use it to post links. N.B. Guys is a unisex description and will be used until someone comes up with a better or more sensible one. There is a lot of rubbish and hype talked about 3D printing so it’s a good idea to understand what is available and what the differences are. There are different types of 3D printers and although anyone can buy and use any type at home the practical choice comes down to what is affordable and where can it fit in your home. Today, for home use, we have 3D printers that are akin to grey-scale ink jet printers. In other words they are several steps beyond the thermal printers which are common on till receipts (so that they fade away BEFORE your guarantee runs out and you can’t take stuff back ) but they were the first releases of domestic printers back in the 80s. Then we got dot matrix printers using a series of dots to make up grey-scale images. Next came grey-scale ink jets and now we have full colour ink jet printers of very high quality. As for types there are Laser, Thermal Point and Deposition. The first two are usually regarded as commercial and are big, expensive and very, very, good. These are the types used by Shapeways and other commercial outlets. They depend on either focused laser beams or heated electrodes to fuse the printing medium into the shape you want. The laser printers tend to use a powder medium and as such can cope with soft metals such as silver, aluminium or gold. The heated electrode medium tends to be a liquid plastic. Both of these types, in fact ALL 3D printers, build up the print one layer at a time. The printers for home use are mainly deposition printers and as the name suggests they deposit layers of molten plastic for the actual print object. The reason for their low price is that they have limitations as to speed and what they can produce. Deposition printers for home use are normally gravity fed and this means that hollows and overhangs need supports to prevent them sagging and these need to be removed from the finished print and probably sanded clean. They are also instruction critical in that if your printer specifies a height of 0.2 mm above the bed then you need to get it spot on for best results. You will need to pay attention to your object shape and how it will print on the bed. The superb canopy truss and stanchion below from Wizmacnz is a nightmare for a deposition printer. 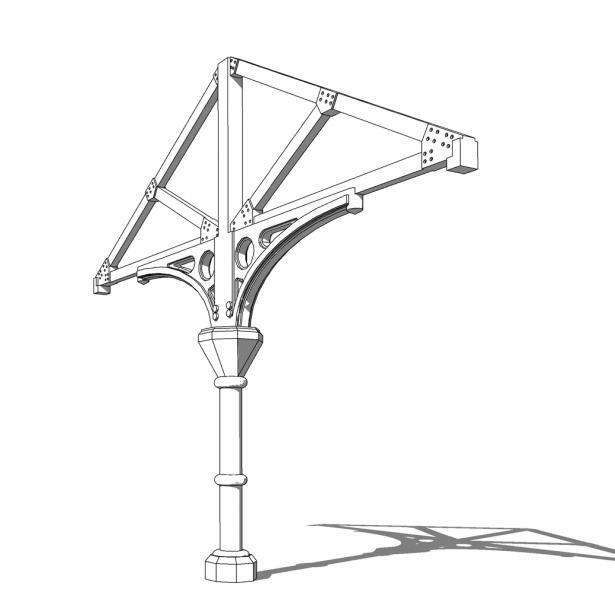 If printed as seen it will look like a creeper infested tree as it will have supports from the span arms to the bed, the hexagonal/octagonal mounting to the bed, the curved span arm supports to the bed, the curved support arms to the horizontal span arms and between the actual angled truss arms and the main span and the central truss supports. There will also probably be support material inside the circular openings. Of course it can be done but it needs to be in two halves and laid flat on its back and glued together afterwards. The reason these problems don’t exist on the commercial 3D printers is that laser and heated electrodes are focused from outside the work piece and inside a supportive medium so no support columns are needed. 3D printers are like any tool you need to practice using them. In the case of 3D printers you also need to learn to use several different programs. Obviously I’m no expert but I have learned from trial and error.